I’ve quickly become a fan of games that mimic smartphone interfaces, as it’s something I’m already used to using nearly 24/7. The genre lends itself so well to storytelling if done right. You rummage through different apps and unravel the story bit by bit and feel a little like a detective as things start to make sense. 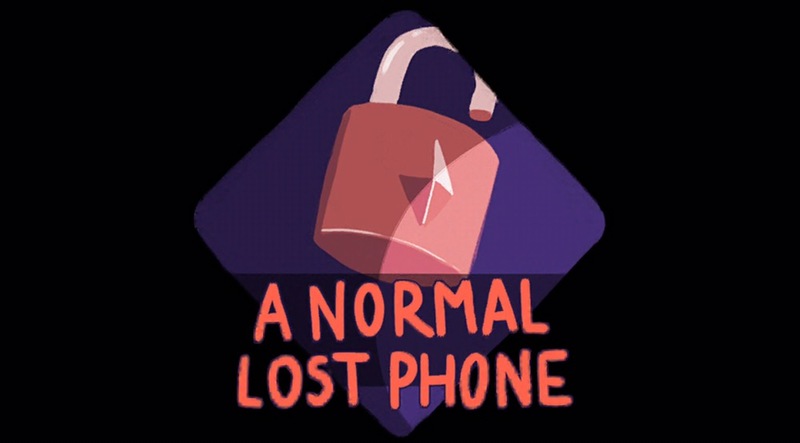 So I was looking forward to playing Accidental Queens’ smartphone-alike, A Normal Lost Phone (ANLP). 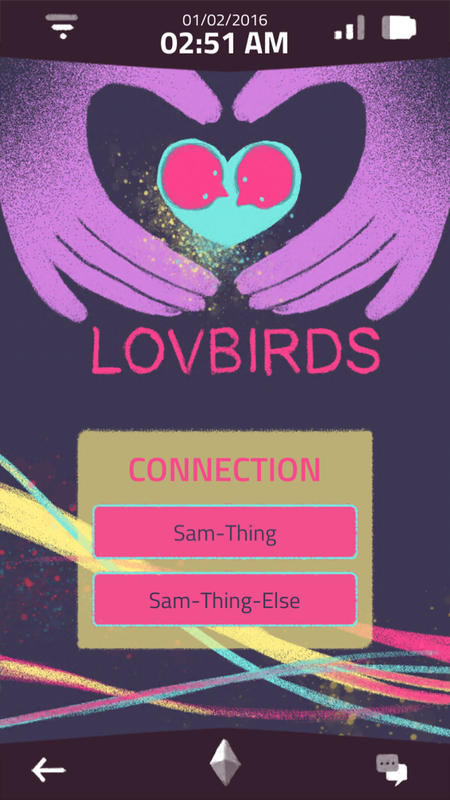 Originally developed during a game jam, it’s since been expanded on for commercial release. This is the first time it’s available on iOS, though, so I can’t compare this new version to the original or say whether it’s worth playing if you already experienced the earlier version. But there’s a lot here to like if you’re a fan of these types of games. 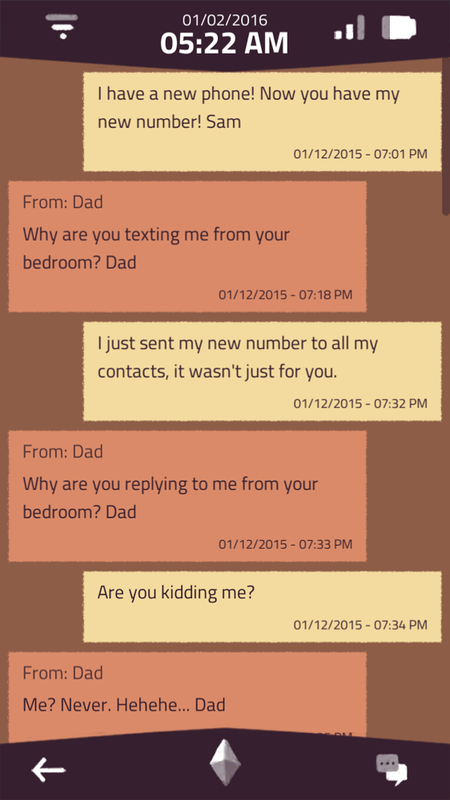 When you first boot up the game, you’ll get some text messages from Dad. Scrolling up will reveal that this phone belongs to someone named Sam, and that it’s only a couple of months old. That helps keep the game focused, as you’re not seeing years of texts. This is a window into a specific period of an eighteen-year-old’s life and their closest relationships. It will be most relatable to those around the same age, but it’s still easy to recommend to adults as well. Anyone who ever felt misunderstood or out of place should be able to find something of value here. Right away, the game reminded me of Replica, but not so much in story as in puzzles and layout. Replica is about terrorism (or at least the appearance of it), while ANLP is a coming-of-age story told through texts and emails. What makes them similar is that they both ask you to rummage through the phone looking for clues to find passwords to unlock different apps, thereby accessing more information. It’s a really great way to implement puzzles in a game like this, so it doesn’t feel like all the information is just handed to you on a platter. However, much more is available right off the bat here than in Replica, and I do think it suffers a bit for that. For instance, I preferred Replica’s opening, where you have to figure out the password to unlock the phone. It seemed more realistic, as I can’t imagine anyone keeps their phone unlocked these days. Even though the game does explain it so it’s clear it’s not an oversight, the explanation didn’t sit so well with me. After all, this is about a teenager who’s very secretive about certain things, and I can’t imagine anyone leaving their phone unlocked, especially someone with things to hide. Overall, the game is also much lighter on puzzles than Replica is. But there are still some passwords to crack, even early on, as you can’t check Sam’s email, use the browser, etc. without somehow connecting to WiFi first. Some of the passwords are fairly straightforward and shouldn’t cause too much trouble, while others feel like more of a stretch. Those passwords are more obvious in hindsight, once you’ve used them to find out more about Sam, so this is a bit of a weak point. But they still shouldn’t offer too much trouble to a player with a keen eye. 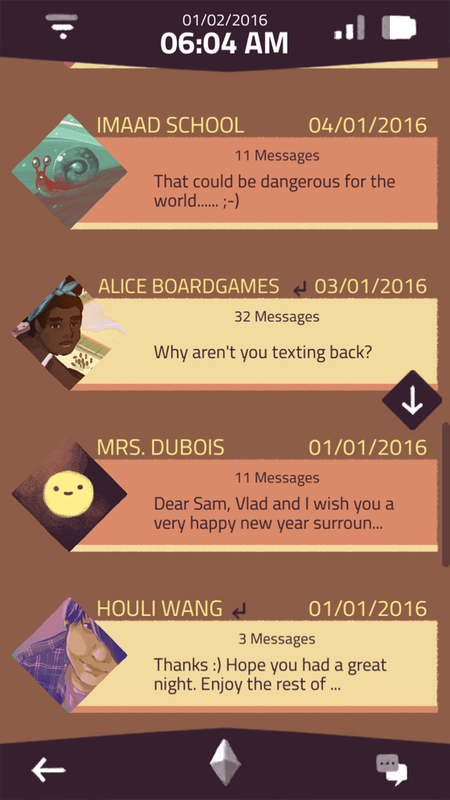 I’m very thankful that the game’s not in real-time like many text message-based games, because I’m not a fan of waiting between texts. But I do think information could have been given in more bite-sized chunks to make them easily digestible and offer the player more direction through the story. As is, all text messages are available right from the beginning and it can feel a little overwhelming. For instance, I would have preferred Telltale’s Mr. Robot:1.51exfiltrati0n.ipa without the real-time waiting between texts, but I did like how new texts got triggered throughout the game so they slowly trickled in. There are a few rare instances like that later on in ANLP, but in the beginning it feels pretty daunting to be faced with a wall of text. What also didn’t help in the beginning is the sluggish scrolling. 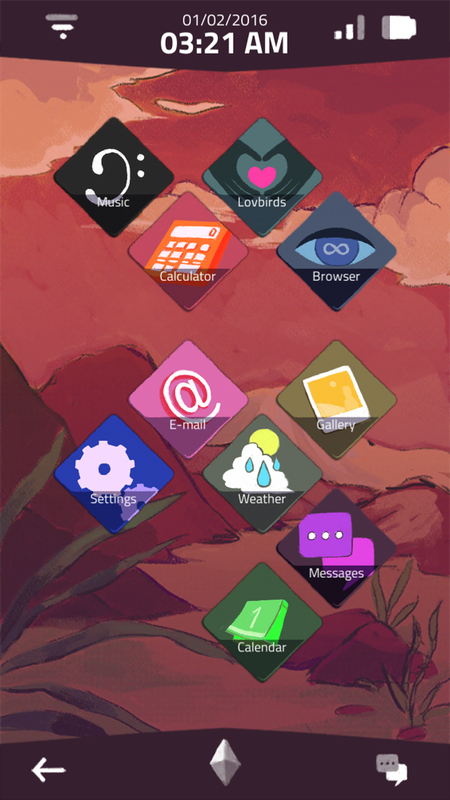 Even though they did a good job mimicking a smartphone interface, it doesn’t feel smooth and snappy like an iPhone. I also didn’t realize until I had already been playing for a while that I could tap on the arrow that appears and instantly scroll to the top or bottom of the page. Each text message conversation starts at the latest text, so until I noticed that shortcut, I was slowly scrolling up to the top of each conversation so I could read it in chronological order. This made it feel like a chore until I started getting sucked into the story and the characters. It also doesn’t help that if you minimize an app, you lose your place. You can press the back arrow to relieve that issue within the same app, but it’s very easy to forget that’s even an option. As someone who has my iPhone glued to my hand, it’s a habit to tap the Home button and flip through apps, all which save my spot. To be fair, Replica behaved the same way as ANLP, but there were very few text message conversations to scroll through. Still, this shouldn’t deter you from playing the game. As long as you use the arrows to scroll faster, it’s not too much of an issue. 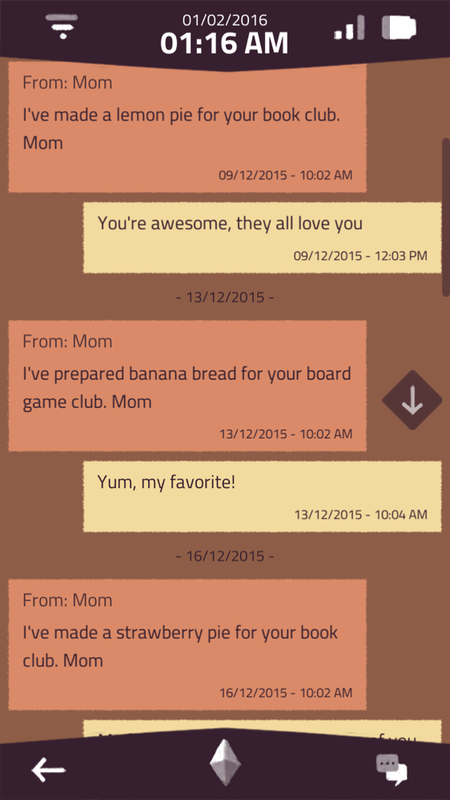 There are some nice little touches in the game, such as having Mom and Dad sign off on each text like it’s an email. 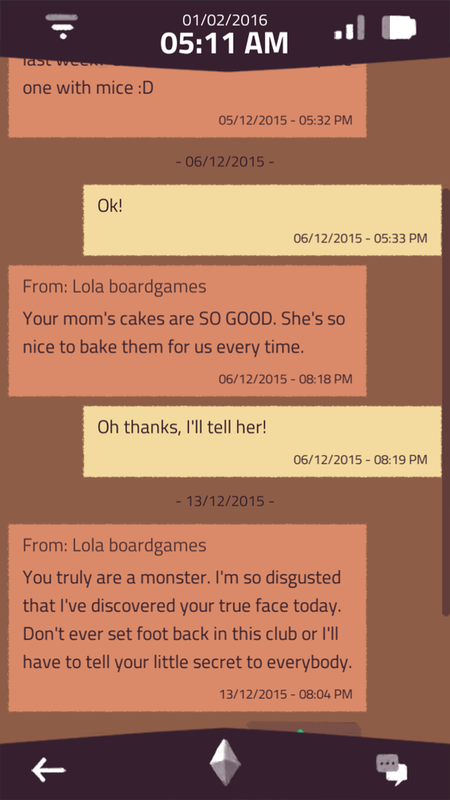 I also loved the little running jokes, such as Mom’s incessant baking. There are ways the game gives each character a unique voice, like one who leaves out most punctuation and another that never capitalizes any letters. And the way each of Sam’s contacts is named offers clues to their place in the story. Perhaps there could have been more typos, like in Mr. Robot:1.51exfiltrati0n.ipa, to make it seem a little more natural. The spelling and grammatical errors seem to be limited to specific characters, even though in real life I can’t imagine anyone always texting perfectly. Still, there’s enough variation between the characters to make them come to life even if we only know them through this brief moment in Sam’s life. The most notable part of the game is that it deals with sensitive themes. It stands out from other games because it takes subjects that are hard to talk about and makes them very relatable and easy to digest. Some might argue that it doesn’t go far enough, that it doesn’t have enough of an edge, should maybe be grittier, but I think it gets its message across in a respectful and meaningful way without being overly preachy or sappy. These relationships are messy, and even though we’re dealing mostly with teenagers, anyone should be able to think of a time where they felt they had no choice but to lie to someone they love. I don’t want to say too much about that, though, because it might spoil the story. But I think the game did a good job using its format to keep the mystery going through most of the experience and to help us empathize with Sam. The game feels a little like Sam Barlow’s Her Story while you’re playing it, mostly because it keeps you guessing about what happened to Sam. But unlike Her Story, it ties everything up into a neat little bow in the end, answering all your questions. So even though it is worth going back after and reading through the texts again to see what you overlooked and how it all fits together, you’re not really going to end up on message boards arguing over what actually happened. The story does deserve to be discussed for other reasons, but as I mentioned, I can’t really talk much about that here without spoiling it. I’m not sure if keeping the mystery would have made it a better game. It’s easy to speculate about that after getting proper closure. In any case, even knowing what happens to Sam, you can still imagine other ways it might have played out, and perhaps that’s all that’s really necessary. Were there ways that A Normal Lost Phone could have been better and more effective? Sure, but it’s still a game very worth playing and experiencing. Story-wise, I think it has a lot to offer, but puzzle-wise it could have been beefed up a bit. Even if it doesn’t feel like it fully reached its potential as a smartphone-mimicking game, it does do a good job keeping the mystery as you try to fill in the gaps and unlock more information. It tells a relatable and important story that should also draw some empathy from people who aren’t personally familiar with this topic. Again, I don’t want to spoil it so I’m being vague. But even just from a standpoint of unraveling a mystery, there’s a lot to offer here. 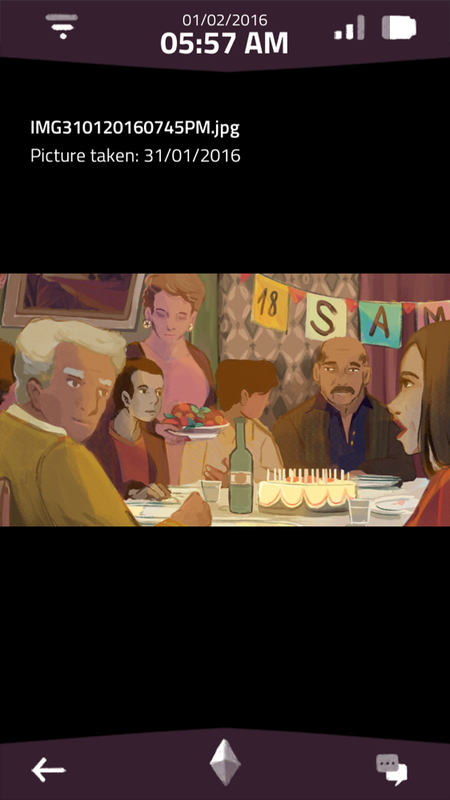 I’m glad I got to step into Sam’s shoes for a little while and, as long as you go in expecting more story than puzzle and not a fast-paced spy thriller, I think you should be, too. If it sounds like your kind of game, you can download it here. If you need any help with the game, you can try my step-by-step walkthrough.